The least expensive reservation channel is your marketing website, which can be integrated with the RDP's commission free booking engine to display rates and availability and complete the reservation process. (Internet Reservation Module - IRM). We now offer the Mobile IRM, which is our booking engine formatted to work with SmartPhones and Tablets. See: Marketing Website Integration - IRM.Net or RDPAPI Web Services. For more information see: RDP iHotelier / TravelClick Two-Way Interface. RDP's interface works with both the Advertizing Model and the "Pay-Per-Reservation" model from HomeAway. With the Advertizing model RDP sends all content to HomeAway, and reservations can then be made on RDP's commission Free Internet Reservation Module. RDP has an interface with Jack Rabbit Systems, who allow your rates and availability to show on various "Meta Search" websites, such as Google Hotel Finder, Trip Advisor, and Trivago. For example, in Google if you type "Hotel in Chicago", Google automatically shows the Google Hotel Finder Screen, listing various Chicago area hotels, with rates and availability. With RDP's Jack Rabbit Meta-Direct interface, your property can appear in Google hotel finder. The guest is sent from Google Hotel Finder to RDP's commission free Internet Booking Module (IRM) to make the reservation, bypassing any fees you might have to pay to your GDS provider. Meta-direct has become a very popular method of making reservations, with significant growth in the future. RDP's Jack Rabbit interface allows your property to share in this powerful channel. RDP has a full two-way interface for rates and availability to Expedia using Expedia QuickConnect. This interface is not required if you use the RDP TravelClick/iHotelier 2-way GDS Interface (see above). 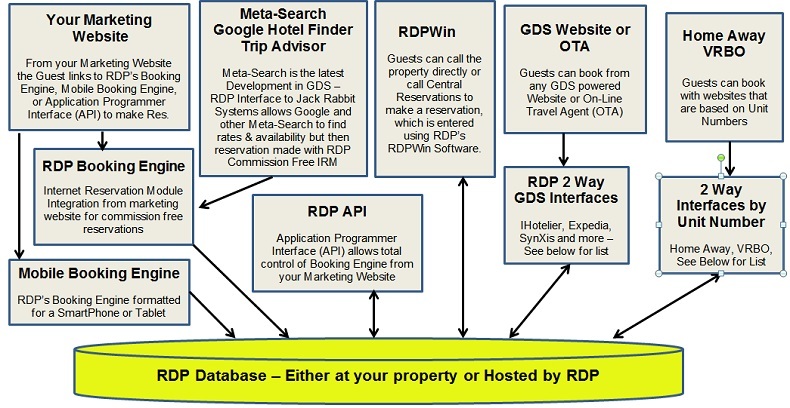 RDP has a full two-way interface for rates and availability to the Global Distribution System (GDS) via the Sabre Hospitality Solutions - SynXis suite of products and services. SynXis can distribute your inventory to traditional and online travel agents such as: Expedia, Travelocity, Orbitz, etc., as well as via their website booking engine. For more information see: RDP SynXis Two-Way Interface. RDP has a full two-way interface for rates and availability to the Global Distribution System (GDS) via the Inntopia suite of products and services. Inntopia can distribute your inventory to traditional and online travel agents such as: Expedia, Travelocity, Orbitz, etc., as well as via their website booking engine. They also offer an interface to local Central Reservations organizations as well as internet Marketing and Consulting Services. This interface is not required if you use the RDP TravelClick/iHotelier 2-way GDS Interface. For more information see: RDP Inntopia Two-Way Interface. Resort Data Processing (RDP) has partnered with RCI to develop the RCI Exchange Interface Module. This module is designed for our Timeshare and Interval Ownership customers and eliminates the manual process required to confirm ownerships of exchange reservations. It also retrieves inbound reservations and automatically enters these reservations into RDP. RDP has a full two-way interface for rates and availability to the Global Distribution System (GDS) via the InnLink suite of products and services. InnLink can distribute your inventory to traditional and online travel agents such as: Expedia, Travelocity, Orbitz, etc., as well as via their website booking engine. They also offer internet Marketing and Consulting Services. For more information see: RDP InnLink Two-Way Interface. RDP has a full two-way interface for rates and availability to the Global Distribution System (GDS) via the Windsurfer from Sceptre Hospitality. Windsurfer can distribute your inventory to traditional and online travel agents such as: Expedia, Travelocity, Orbitz, etc. Their advanced features are designed to optimize revenue across all distribution channels. For more information see: RDP Windsurfer Two-Way Interface. The Generic Reservation Channel Interface is a general 2-Way Global Distribution Interface that can be used for a variety of reservation channels not listed above. RDP frequently adds new distribution channels using the Generic Interface as a starting point.